If you’re aiming to create a spa-like feel in your master bathroom on a budget, combine the benefits of a luxury custom shower and the visuals of natural wood grain with a wooden shower panel. Wooden shower panels are likely not an option you’ve heard of, but they’re bold statement pieces that can command the feel of the room while keeping you clean for a fraction of the price of a custom-built shower. Whether you want the whole bathroom to have a wood style or just a touch of it, these multi-sprayer panels can bring the spa home to you. 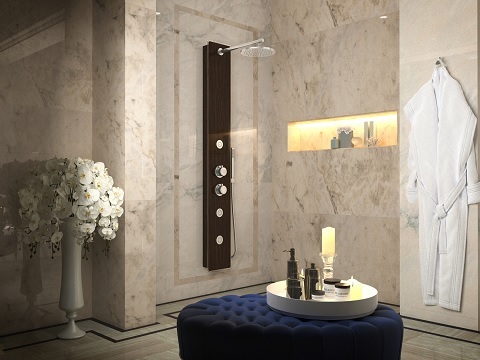 In case you’re not familiar with shower panels, they are a shower upgrade that includes add-ons like spray wands, shower heads, and multiple control knobs, all contained within a single, large panel against a shower wall. They require only one hookup to install, replacing your existing shower head and giving you luxury in your shower without tearing out a wall for additional plumbing. 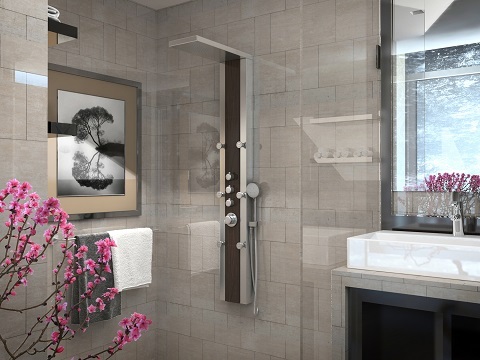 They provide all the benefits of a custom shower, but without the custom shower price tag. 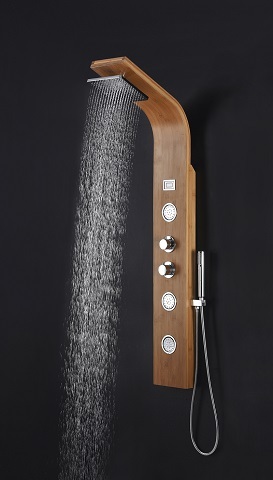 Why choose a wood finish over other shower panel options? Simple: Wood feels warmer and more natural than chrome, steel, acrylic, and other styles. A wood-lined bathroom feels more like a luxury sauna than a room to just do your business, and you can better enjoy your time getting ready each day. Each shower panel is sealed to be waterproof, so you don’t need to worry about the wooden panel molding. Choosing a material for your shower panel is a big consideration because it is going to take up a lot of wall space in your shower, and therefore should be visually fitting to the bathroom around it. 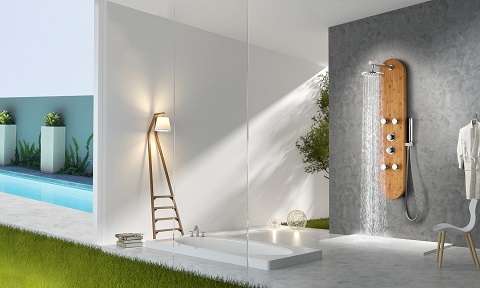 Along with a more natural look using wood, you can also be more environmentally conscious with shower panels. They consume less water than custom showers because they use the same hookup as your current shower head, so using the extra sprayers redistributes the water to where you want it without adding a lot of extra usage (and extra cost) to your water bill. Matching a shower panel to your bathroom look may feel risky if you’re planning on renovating or moving in the future. After all, a shower panel is a big investment in the quality of your bathroom compared to a traditional shower head. If that becomes the case, don’t worry! Shower panels, being a single unit, are as easy to uninstall as they are to install. If you decide to change your bathroom look entirely, you can move the panel to a different bathroom with ease; and if you absolutely love your shower panel, you can take it with you to the next house without leaving luxury showers behind. Do you only want a touch of wood accent in your shower? There are options for that as well. You can get primarily metal shower panels with wooden accents, perfect for those who love the wood grain and functionality of shower panels, but a full wooden panel would clash with your bath. Though nothing beats a day at the spa and sauna, you can have high-quality jets and calming natural atmosphere every time you shower, and that you don’t need a weekend getaway for. This entry was posted in Bathroom, Showers and tagged Bathroom, Shower, Shower Panels.